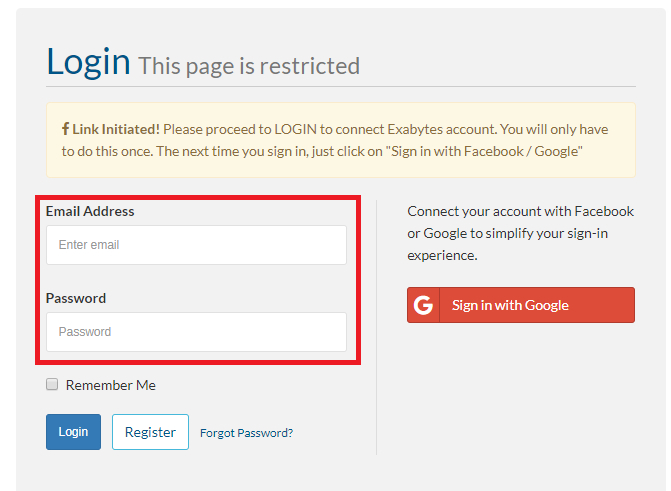 Home Exabytes Tips Sharing Login to Exabytes Account with Google! Login to Exabytes Account with Google! Exabytes services just got better! As an Exabytes client, you deserve the best, including the most convenient way to login to your Exabytes account. You Can Now Easily Login to Exabytes Client Area in just 1 Click! This feature allows you to connect your Google account with your Exabytes account. Enjoy a simple and faster login experience and get assistance from Exabytes whenever needed. Easy to access; a password is no longer needed after the first login. Stay logged in and never have to reset or recover your login again. We strongly encourage you to connect your Exabytes Client login with your Social Login now, so that you can enjoy peace of mind whenever you need to check on your product subscriptions or other info. ** IMPORTANT NOTE: You are required to manually perform first login after connecting your Google account. Click on “Sign in with Google button”. Once you see “Link Initiated!”, you are required to perform the First-Time login to your current email address registered with Exabytes. Bravo! It’s done. You can see your panel now!